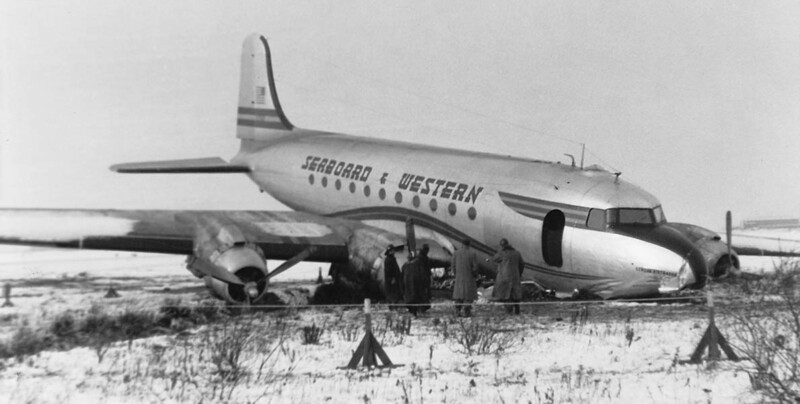 On November 22, 1955, N75415, a Seaboard DC-4 named Geneva Air Trader landed at Gander. The runway was covered with ¼ inch of snow. The aircraft ran off the runway and into a ditch. None of the four crew members were injured. Skilled mechanics repaired the damage and the aircraft flew out and returned to service. Additional photos can be seen on the Website of the Gander Airport Historical Society. A comprehensive report of the accident by Robert G. Pelley can be read at http://bobsganderhistory.com/SWGenevaAirTrader.pdf.